How fortunate we are, how BLESSED we are, to have this President and his beautiful family in the White House!! It's good to have a President who can multitask. Does anyone notice how Pres. 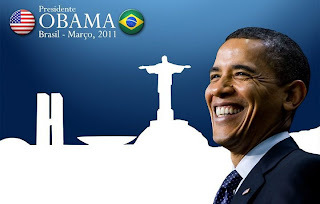 Obama is brining peace & delivering positive messages internatio¬nally in Brazil as well as showcasing the concepts of peace in Libya. Sarah Palin is delivering messages of negativity in India & now Israel. This showcases how Sarah is not fit, & the concepts that Republican¬s espouse will not be welcome on an international level.